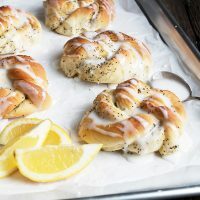 These lemon sweet rolls are lovely, light yeast sweet rolls, filled with lemon sugar and topped with a lemon glaze. Happy first weekend of Spring! 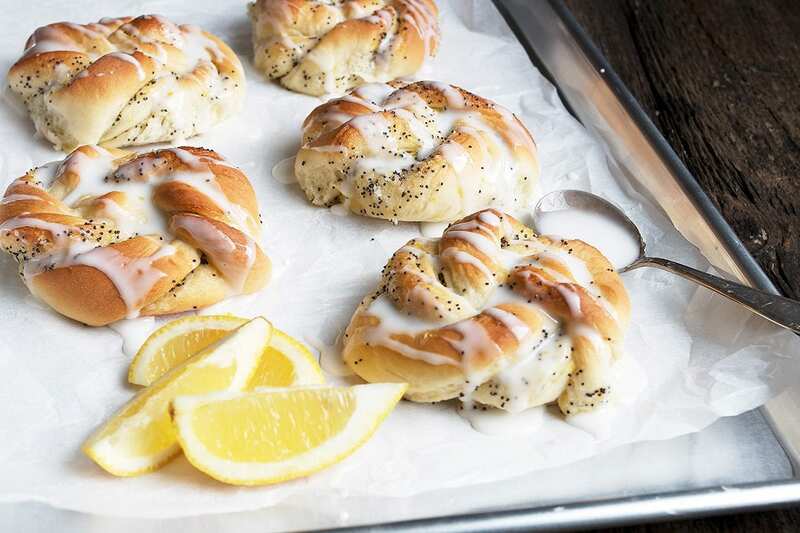 If you’re in the mood for a little baking this weekend, these Glazed Lemon Poppy Seed Knots are a fund and delicious bake. 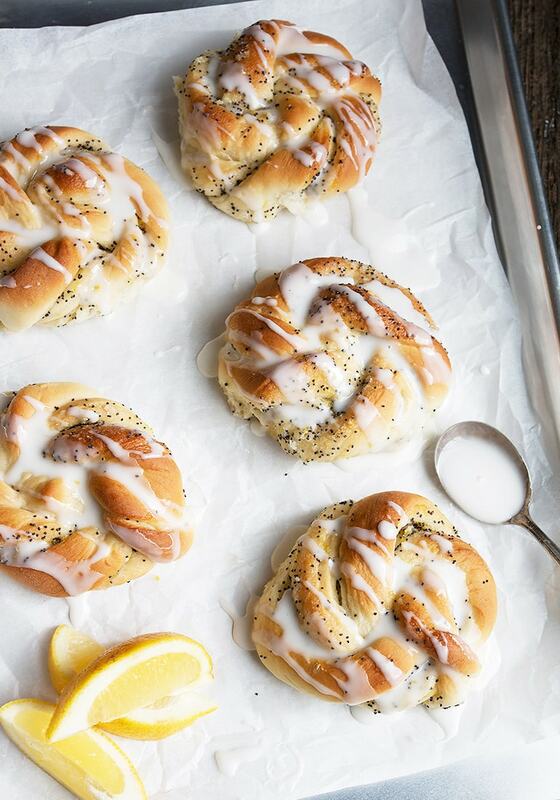 These pretty lemon sweet rolls are filled with lemon sugar and poppy seeds, baked up in moist, light dough, tied into pretty knots and topped with a lemon glaze. 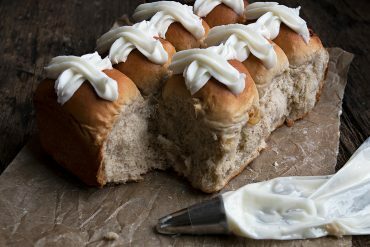 These pretty and delicious sweet buns would make an excellent addition to your Easter weekend or Easter brunch table! 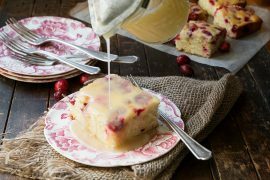 So if you’re in the mood for some delicious sweet rolls this weekend, I hope you’ll give this one a try! Note that this recipe calls for a “starter dough”, that is a small amount of dough that is mixed up and allowed to sit for a few hours. 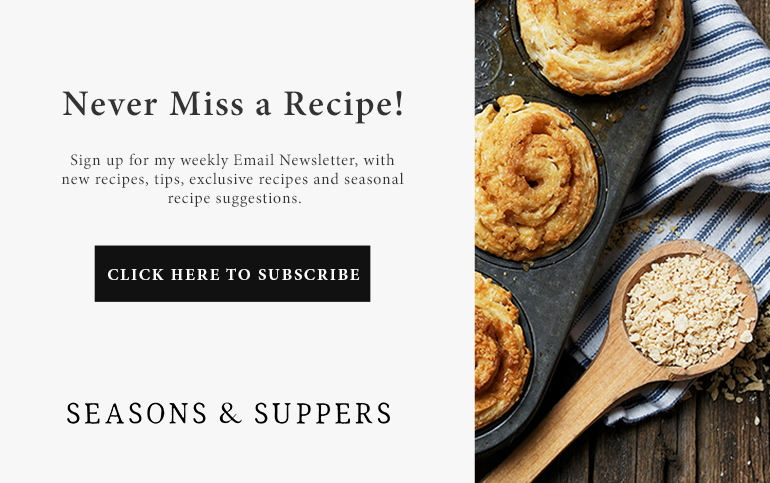 So you’ll want to plan for this and prepare the starter dough early in the day, then you’re ready to shape and bake in the afternoon. This process develops great flavour in the dough. 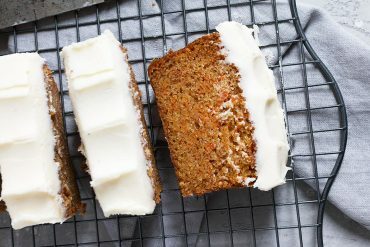 You can make these ahead and freeze them, if you like. I would probably freeze them without the glaze, then glaze before serving. 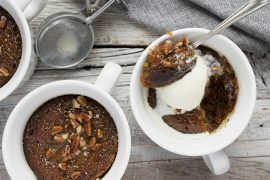 If you prefer, you can skip the glaze and dust with icing/confectioners’ sugar, instead. Don’t be intimidated by the shape. It’s super easy and I’ve included some shaping photos below for you, as well to show just how easy it is! 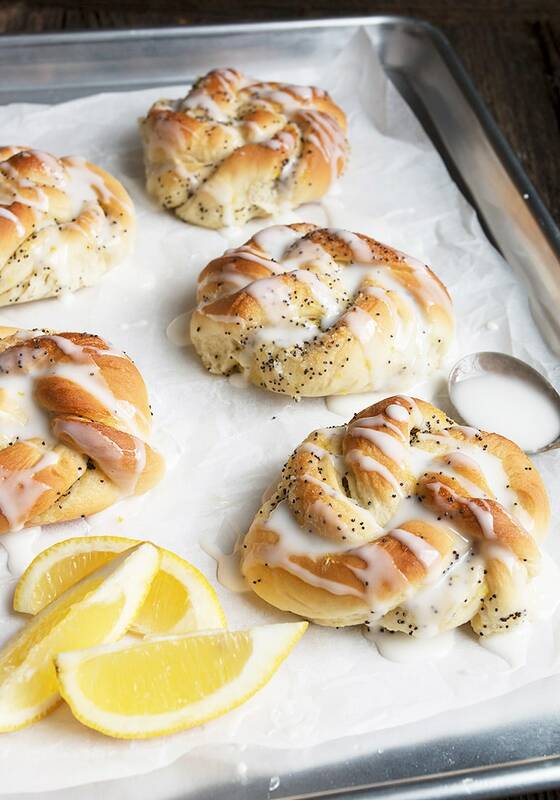 Delicious sweet rolls, filled with lemon sugar and topped with a lemon glaze. For the starter dough: Stir together all ingredients in a medium bowl. 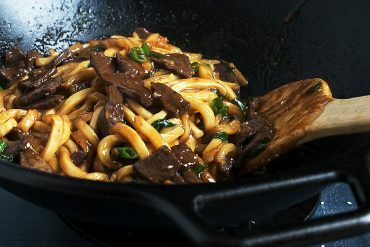 Cover and let stand at room temperature 4-5 hours. For the final dough: Add the starter dough to a large bowl or the bowl of a stand mixer fitted with a kneading hook. Add the yeast, milk, sugar, salt, egg and butter to the bowl. Mix to combine. Add 2 cups of the flour and mix to combine. Add additional flour 1/4 cup at a time until you have a smooth, moist dough. Remove dough to a greased bowl, cover and let rise until doubled, about 45-60 minutes. Meanwhile, combine sugar and lemon zest for filling in a small bowl and set aside. 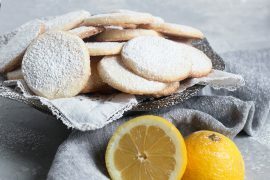 Prepare a large baking sheets with parchment paper and set aside. Remove dough to a floured surface and roll into a rectangle 12x16 inches. Brush dough with melted butter, then scatter sugar/zest mixture evenly overtop. With the short edge of the dough closest to you, fold the top half of the dough down and over the bottom half, making an 12x8-inch rectangle. Using a sharp knife or a pizza cutter, cut the dough into twelve 1-inch wide strips. 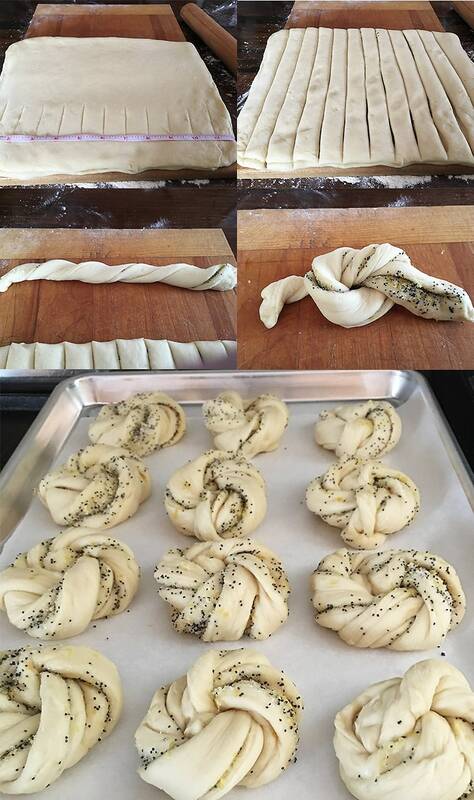 Take one strip of dough and holding both ends, twist 5 or 6 times. Tie your twisted strip into a knot, then take the two loose ends and tuck them underneath, pushing one end up through the centre of the knot to secure. Place on parchment lined baking sheet. Repeat with remaining strips of dough. Cover baking sheet with a tea towel and let rise until puffy, 30-40 minutes. Preheat oven to 375F (190C). When buns are puffy, bake in preheated oven for 20-25 minutes, or until golden. Remove to a cooling rack to cool completely. For the glaze: Stir together icing sugar and lemon zest until smooth. Add additional juice/sugar as needed, to make a glaze that will easily fall off a spoon. Drizzle over cooled buns and allow to set. How would you recommend freshening a frozen roll? 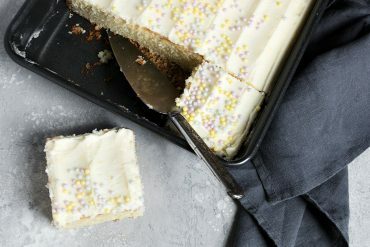 Freeze before baking? Or after? Thanks so much! Hi Shana, I always thaw frozen (baked) rolls in the original packaging, then a few seconds in the microwave to just warm. I usually freeze after baking. Awww, these sum up spring in a second! Can’t believe we’re there already. These look absolutely amazing. Can’t wait to try them! These are everything I want right now! And so perfect for Easter! I would love to eat the whole tray Jennifer! Love the step by step instructions! These look incredible! What gorgeous rolls Jennifer! I love the lemon sugar filling and that glaze too. Such a perfect addition to the upcoming Easter weekend :) Scheduled and pinned!